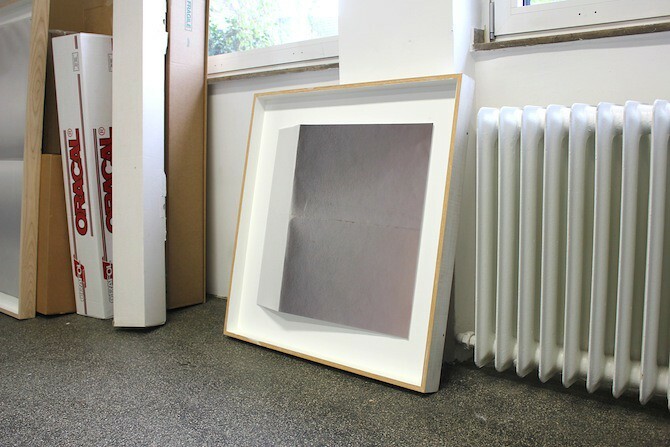 Anna-Lena Werner: Johanna, while it is difficult to define your works' material in a category, your art seems to be all about the exploration of materiality and its transitions. 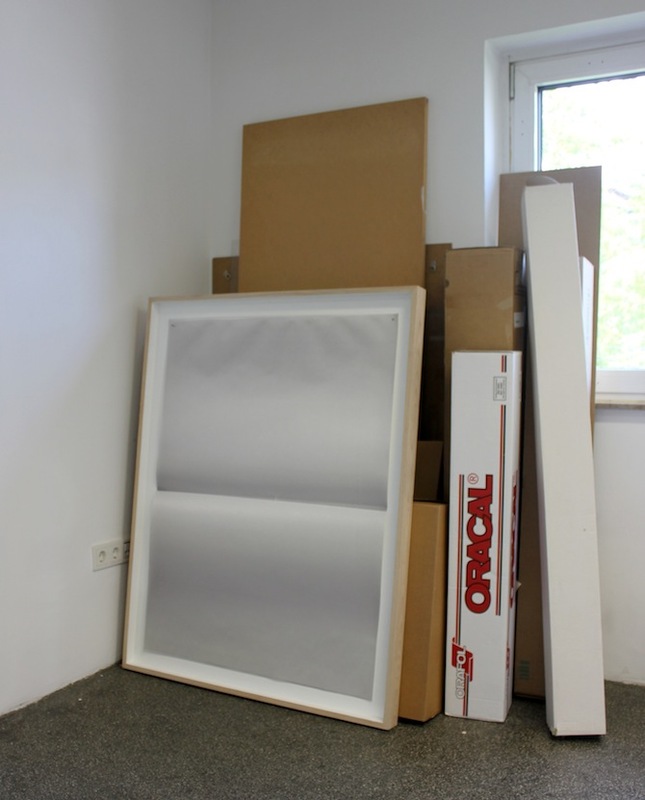 Your works are framed photographs, but they could as well be paperworks, drawings or even wall-objects. How do you label your work? Johanna von Monkiewitsch: None of my works are clear in their materiality. But I often call them fold-works or paper-works. Anna-Lena: What about photography? Do you consider yourself a photographer? Johanna: No, because I simply don't think too much about the position of photography. I use one precise, unedited shot of a real light situation happening on a paper and then I print it on a high quality photo paper. That's it. I find the processes of painting or sculpturing much more interesting. Anna-Lena: Is the medium of photography then just a tool? Johanna: Yes. I am capturing light situations with photography. Not to represent them, but rather to solidify them in a real material, to transport them. 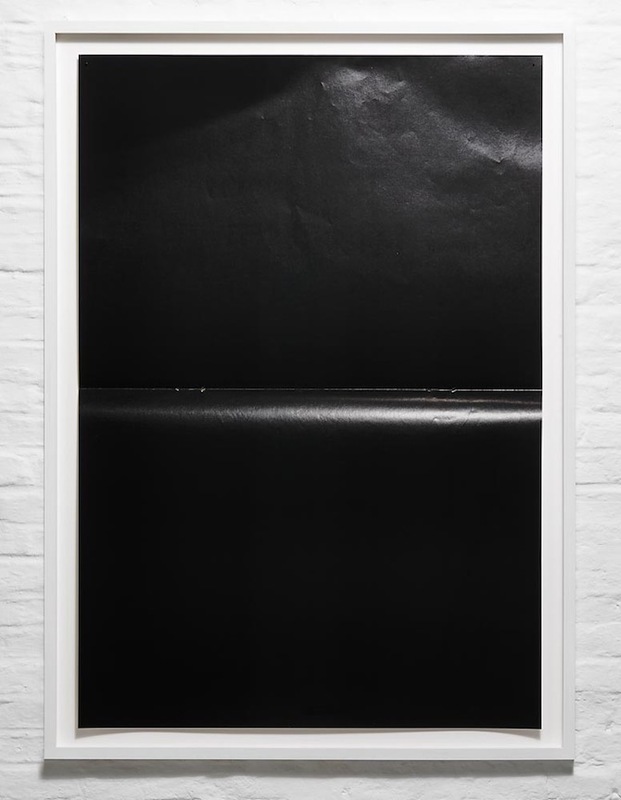 The light situations on these blank papers, that is, their logic of light and shadow opposes the one in the actual exhibition space. 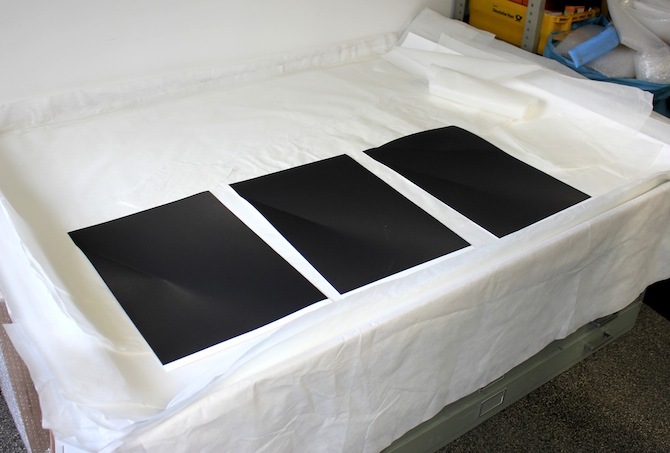 The more distance we get to the work, the more we tend to believe the light composition that we see on the photographed paper. It is a reality that is in-between. An inseparable threshold between real material and virtual representation. 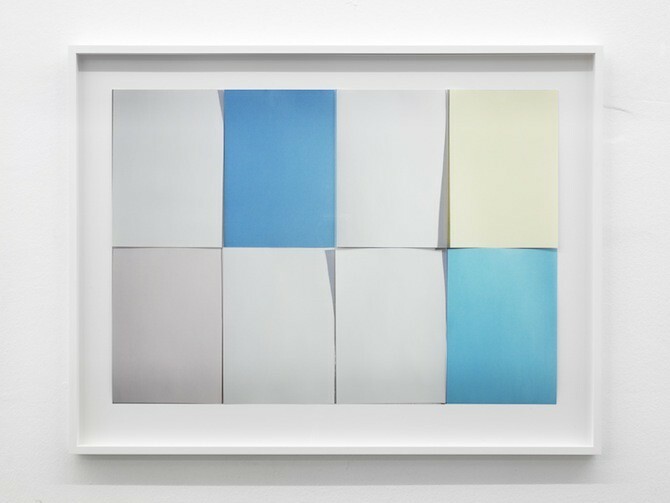 Anna-Lena: In this sense, your work challenges the notion of the original. Is the paper the original and the photographical documentation a copy, or vice versa? 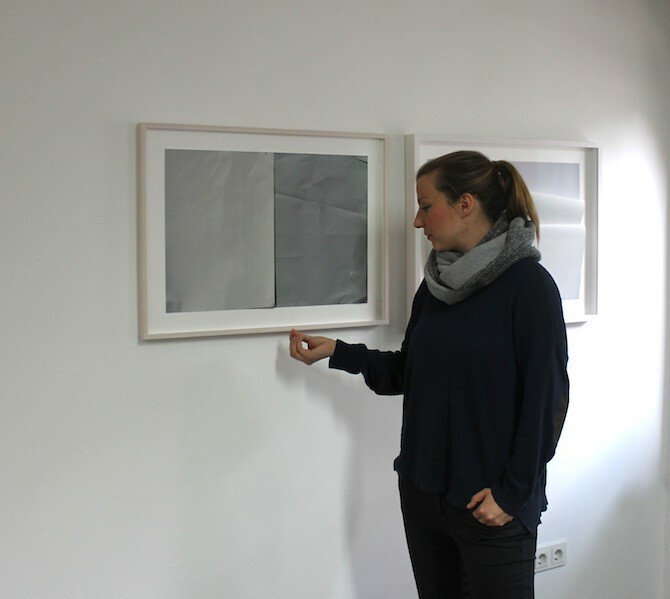 Johanna: For me, the paper is only a raw template. Only through the process of photographing, printing, cutting, folding and creasing it becomes a work of art. That is what makes it artistically valuable – a process of handcraft and sculpturing. I take lots of photos and eventually only choose one. One that seems special to me, transporting a special light situation. 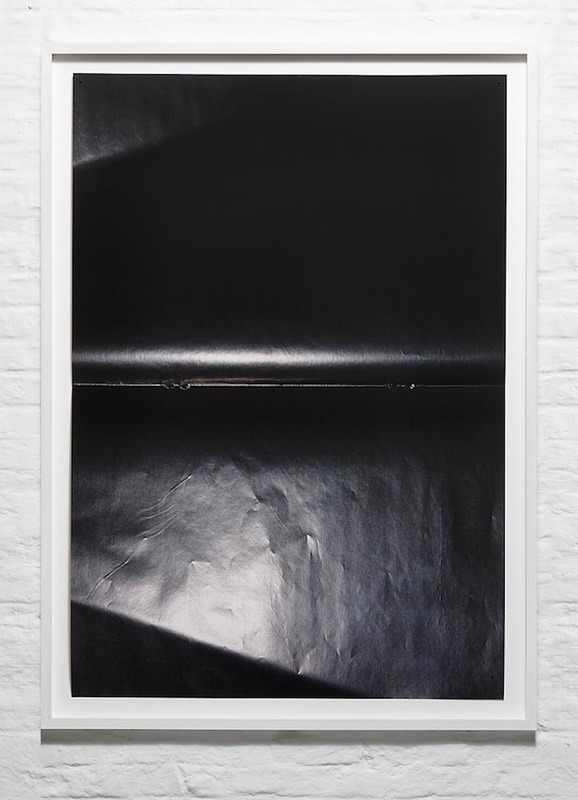 Anna-Lena: The photograph is the original and at the same time it is a reproducible medium. Do you think of them as unique copies or as editions? Johanna: As unique works. The larger works are all singular pieces. I only make editions from smaller works with a maximum of three. 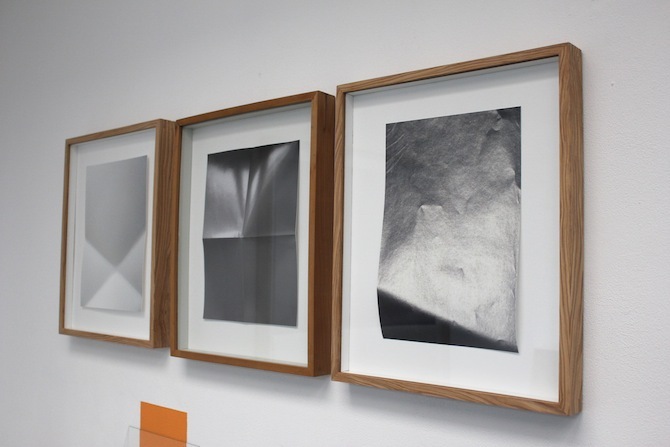 Johanna: …even though the process is the same, a lot has changed since I started to do these fold-works. I fold to let the presence of the photographic medium disappear and to reduce the final work into a pure sense of material and light. It is important to me that the simplicity of the material is apparent, while every work opens a possibility for other readings. Anna-Lena: Specifically your larger works really don't look like photographs at all anymore. Neither do the black works with all the bumps and edges. How do you proceed in works like these? 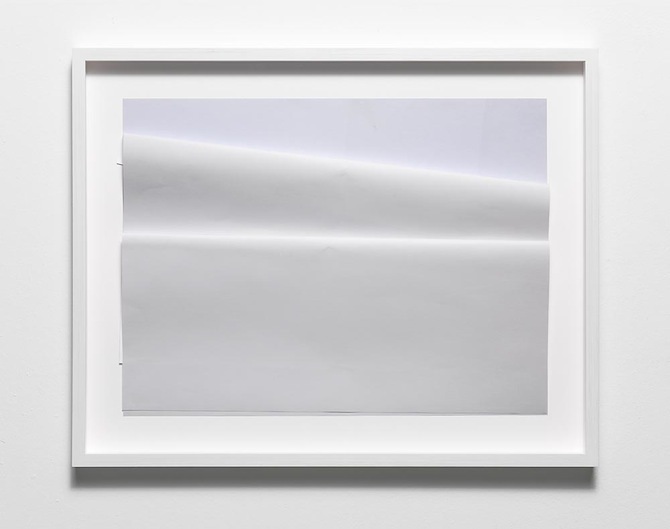 Johanna: Either I fold and crease a blank, letter-sized paper or I find paper that already has traces of usage. Then I photograph it, print it, sometimes scale it up and then I fold the photograph at the same place again. Depending on how it is installed, the light and shadow in the picture interferes with the actual light and shadow in the exhibition space. That is why the actual light situation changes these works constantly. 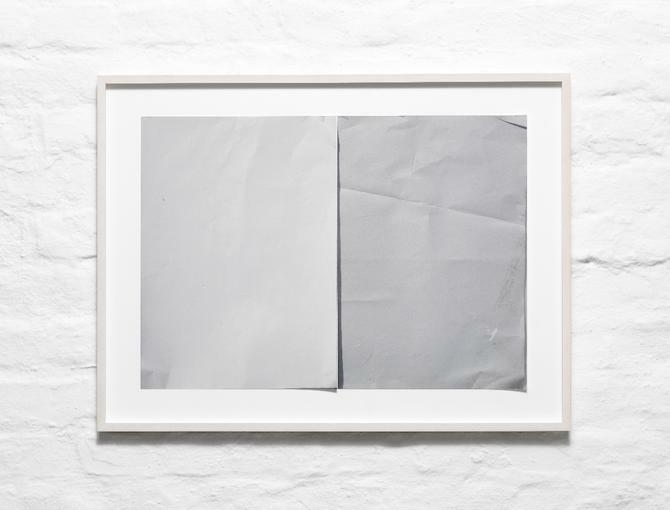 Anna-Lena: One of your paperworks in the studio looks much more dirty and destroyed than the others, which are mostly clean, empty and white. 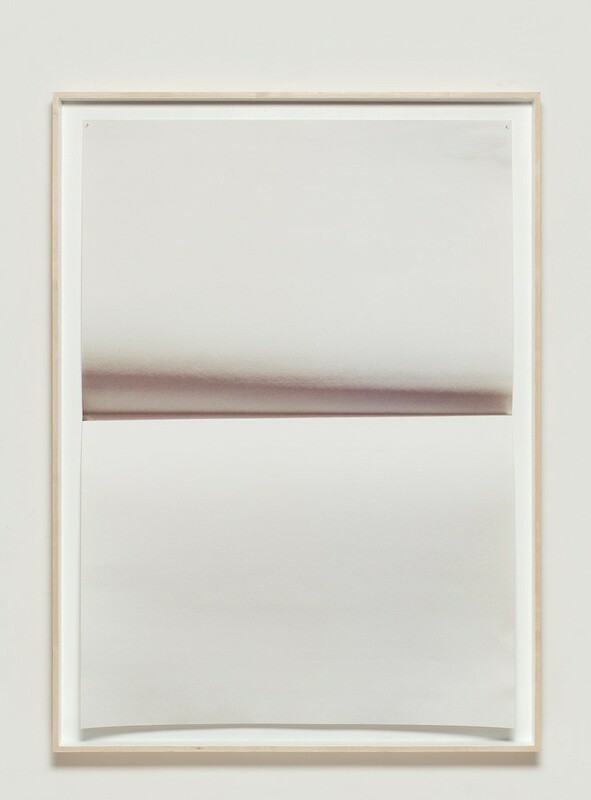 This dominant white emptiness evokes many connotations, such as an allegory of innocence or of blankness, but it also very beautiful and minimal. Is beauty of importance to your work? Johanna: I would say that they are very aesthetic, but I don't think that my work is generally beautiful. It is depicting a presumably banal or unspectacular situation. These clean works are freed from a history and narrative meaning, because I don't want to tell a story. But I do like it when people see something else in my work, such as geometric shapes, conceptualism, landscapes or, as you just said, the white colour being a symbol of innocence. This is legitimate. But for me the white colour is only a tool. 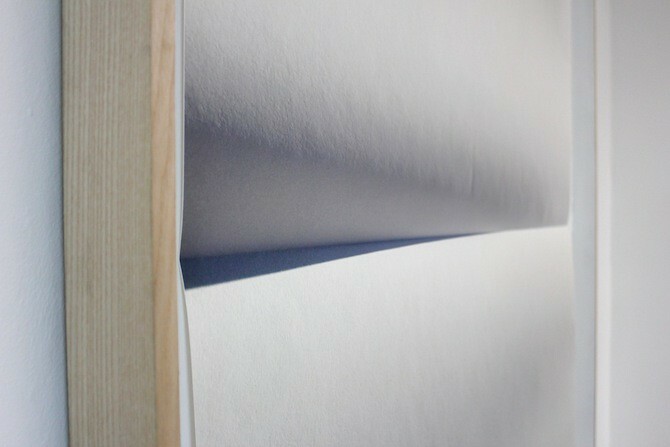 It is the best tone to document ephemeral light situations and to explore the materiality of paper. The dirty work is actually the only one that already has a history and therefore sort of tells a story. Anna-Lena: With your technique of framing you define these, as you said, banal situations as art. 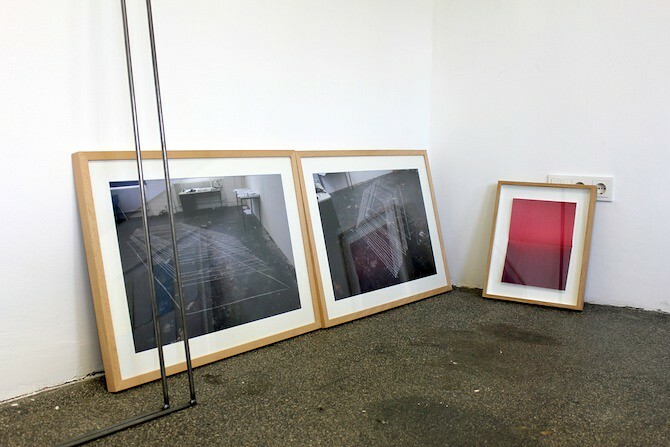 Is there a particular reason why you frame each work? 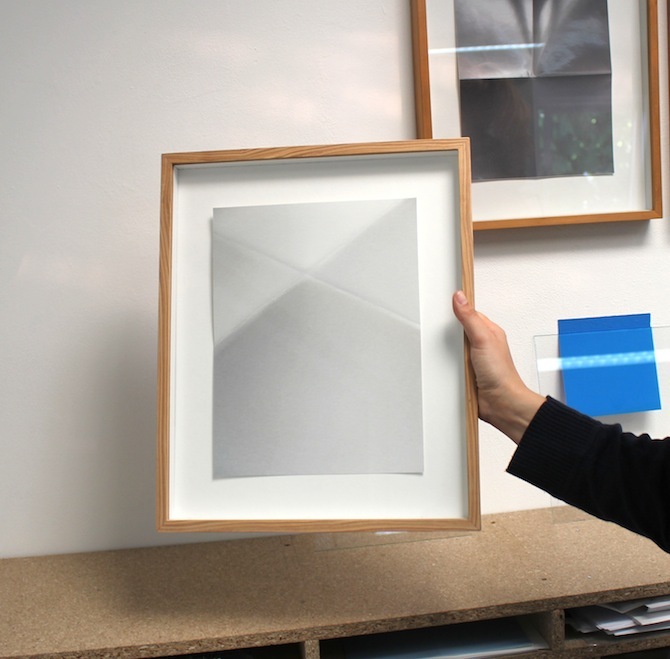 Johanna: The framing reflects the process of production: If I take a photo of a hanging paper then I nail the photograph into a frame, because the act of installing a material into a frame is a process that I wish to be obvious. 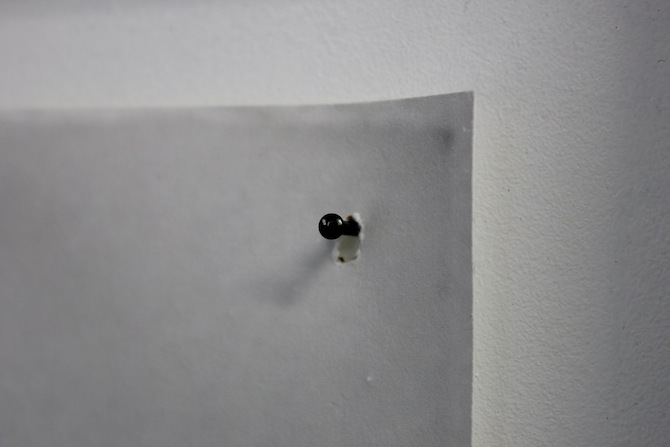 The hanging itself thus comes into the picture, because the nail is still visible. 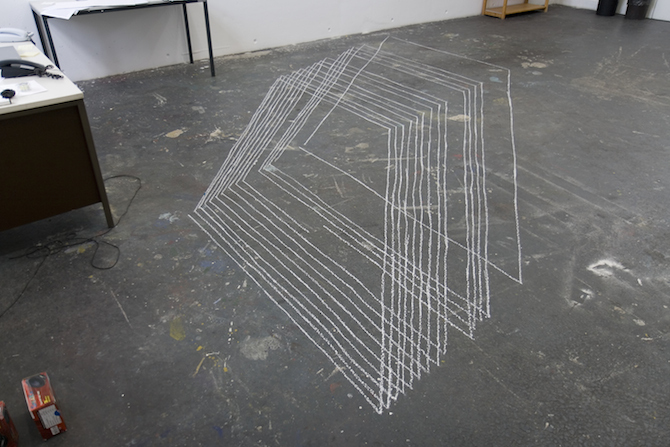 Anna-Lena: You have made one photographic series depicting seemingly three dimensional, geometric chalk drawings. What are these works about? 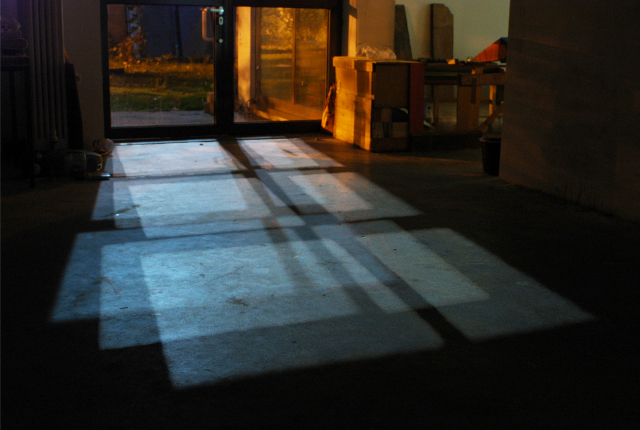 Johanna: I followed and outlined the spatial movements of sunlight on my studio's floor. It was more a curiosity than a concept in the beginning. Then I photographed the drawings from different perspectives, so that the two dimensional form transformed into a three dimensional object. The position from where I took the photo entirely determined how the final work evolved. The sculptural appearance is formed by the natural phenomenon of light, by architecture, by my drawing speed and eventually by the cosmos. Johanna: …on first sight this is true, but I am always hoping that the fold-works also reveal another layer behind the reduced surface. Each of these works also incorporates a sense of light, an intuition, even an emotional mood. Anna: How did sunlight become one of your major motifs? Johanna: As a kid I lived in L.A. for a while. The light in California is so different – it is clear and bright. This affected me very much. Last year I actually went to L.A. again and took some photos – and I was surprised how much you can see the difference of light. It is difficult to transport real light situations that we experience, but this is exactly what I am trying to do. Light, space, materiality – these are the fundamental topics in art that interest me and that I am trying to look at in my work.